On September 23rd, Summerfolk will host a one-day intensive music business conference in Owen Sound to help aspiring and emerging artists of all ages and genres develop the skills they need to start and sustain robust musical careers. Performers spend hundreds of hours learning to play but when it comes to business, practice is difficult and trial and error is expensive. For performers in smaller and rural areas, opportunities to develop their business skills can be even harder to find and lead some aspiring performers to believe that musicians have to move to the city to ‘make it’. When musicians leave rural areas the local culture and economy lose. Summerfolk has been working to support the local and rural music scenes by hosting monthly music business workshops since January with the goal of helping musicians learn about the business from established professionals. The Music Biz Tune UpConference will concentrate the information from the workshop series and go deeper through ten workshops presented in five timeslots throughout the day. “We had a great response to the workshops and this conference will let people who missed them get a large dose of professional knowledge quickly,” said Jon Farmer, series coordinator. Workshop topics range from learning how to register for royalties and how to book gigs, to an introduction to sound engineering and sessions about performers’ unique legal and accounting issues. “We’ve set it up so that there’s something for the people who want to learn what it takes to get their first paid gigs as well as more specific sessions for performers who have been playing weekend shows for years and want to make music their full time job,” Farmer added. Thanks to grant funding from the Ontario Trillium Foundation and sponsorship from Music Ontario, conference registration — a $140 value — is only $50 and includes lunch and dinner. Summerfolk is providing performers who are 24 and younger a further 50% registration discount and is making travel bursaries available. Online registration is open now at summerfolk.org/musicbiztuneup. Notes: Musicians spend thousands of hours learning their instruments but when it comes time to move from the garage to a professional stage they need new skills to turn music from a passion to a business. 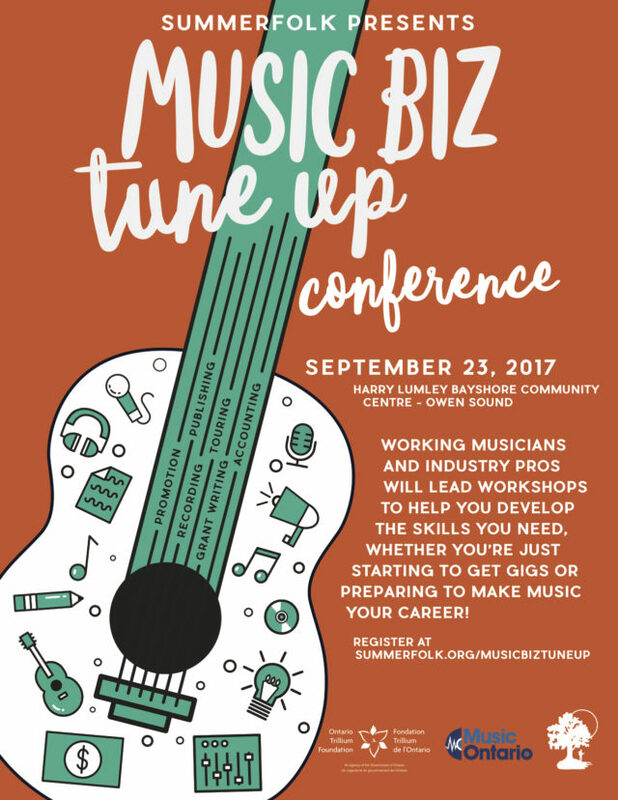 Summerfolk is proud to present the Music Biz Tune Up Conference: a one-day event on September 23rd at the Harry Lumley Bayshore in Owen Sound to help musicians of all genres and experience levels develop and refine the skills and techniques they need to start and sustain musical careers. Working musicians and industry professionals will share their expertise and answer questions in interactive workshops that cover everything from writing a music business plan and your legal rights and responsibilities, to setting up sound and taking care of yourself and your voice while you’re on the road. Sessions will begin at 9am and run until 6:30pm followed by dinner and an opportunity to jam. Lunch and dinner are included with the registration costs. Thanks to grant funding from the Ontario Trillium Foundation and sponsorship from Music Ontario this $140 value conference is available for only $50. Sometimes young performers need a boost so Summerfolk is offering discounted registration packages ($25) and travel bursaries for performers age 24 and under. Please e-mail Jon to apply for the travel bursary.